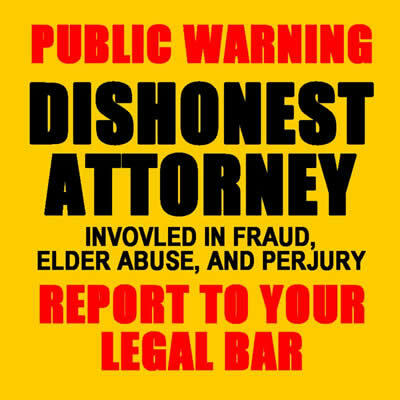 Christopher Overgaard is a dishonest lawyer who perjured documents, sent notice of hearings to the wrong address so parties involved could not object and lied in court. Overgaard failed to properly serve 84 year old Gertrude Gettinger. Overgaard perjured a petition forcing victims Gertrude Gettinger into a conservatorship by her own daughter Sylvia Schmidt who had never cared for her mother for over 35 years. When Sylvia discovered she could force her own mother to pay her $40,000 a year the concept of conservatorship was abused to control her mother and steal her estate. Isolate, medicate and liqudate. Overgaard used illegal tactics such as mailing legal documents to the wrong address so other parties would not object. Overgaard is known to take advantage of seniors.